NEW YORK (AP) – Had things been different, Robert Ellis might be leading country music's long-predicted return to its roots. 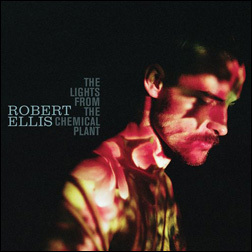 Alas, Ellis finds that role unappealing and has mostly turned his back on his classic country sound with a new album of singer-songwriter-influenced material, "The Lights From the Chemical Plant." This album leans more on the influences of storytellers Paul Simon and Randy Newman than the Texas troubadours who have shown through on his last two albums. This allows Ellis to show off his profound songwriting skills in a different, no less appealing way. He's whimsical on "TV Song," poignant on "Chemical Plant," nails the melancholy barroom piano ballad "Bottle of Wine" and unfurls the racing sails on "Only Lies." He even throws in a well-wrought cover of Simon's "Still Crazy After All These Years" for good measure. All great moments, but the best come when Ellis leans back toward his own roots. When the 25-year-old opens his mouth, we still hear the twang of southeastern Texas. And when he arranged his songs with veteran producer Jacquire King, he usually pushed Will Van Horn's pedal often towering steel guitar to the front of the mix. He addresses this directly on the album's most moving track, "Houston," a song written as he packed his things for Nashville, Tenn., during a recent move. "Oh, Houston, this is not goodbye/you will be living inside my heart …" He finishes that song with a towering guitar solo, then shows you what he can really do on six string with the album's best cut, the honky-tonk hell-and-brimstone burner "Sing Along." In the end, Ellis offers a little bit of something for everyone — not a claim many can make.